De Villejoie has been fighting Geneviève Mulmann for nearly half a decade. Perhaps the most troublesome aspect of the Miss France Wars is that the media has presented a virtual leaning towards Mulmann and her supporters. Instead of treating the affair seriously, the press treats it in an offhand manner, sometimes with bias and blatant bad faith. De Villejoie attacks journalists who do not make their homework and who claim of being totally ignorant of his war with Mulmann. 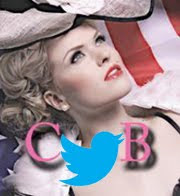 He squirms every time he sees a swarm of journalists flock around a newly crowned Miss without wondering whether she is a fake or a real Miss France. He despises journalists who write whatever they want, including copying articles written by others. The na?ve public picks up on these gaudy reports and tends to believe every word. Almost two years ago, radio and T.V. personality Laure de Lattre interviewed Mulmann in her show entitled, Laure de vérité ("Laure of Truth"). The young hostess was enamored by Mulmann whom she called "charming, moving, and the ideal grandmother." Mulmann commented that de Lattre was "talented and gave a good interview." Mulmann expressed her disappointment with Sophie Thalmann, yet Thalmann was never invited to defend herself. 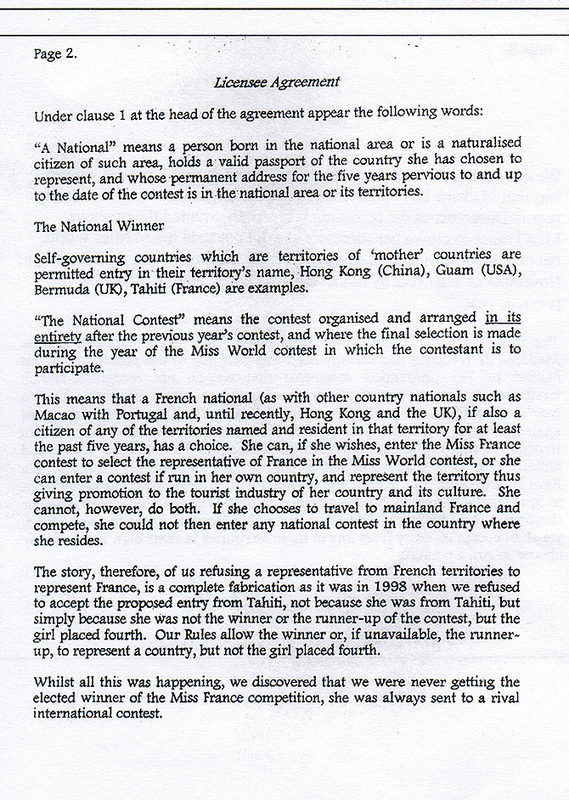 Just like any other naive "reporter" who does not do her homework, de Lattre allowed herself to believe in everything that Mulmann said including the false claim that Elodie Gossuin was a Miss Universe finalist (in de Lattre's website, she put "Miss Monde" instead of "Miss Univers" - an indication that de Lattre is hardly a pageant enthusiast). De Villejoie would soon find out that Gossuin remained in the bottom of the semi-finalist list. De Villejoie discusses an unpleasant experience with the newspaper France-Dimanche that published an article based on the coronation of Mulmann's Miss France. The reporter allowed Mulmann to defame de Villejoie and to say anything against his committee. The irritated de Villejoie wrote a letter to the editor-in-chief who simply replied that he was not responsible for Mulmann's opinions. Another incident proved even less tolerable for de Villejoie - this time involving humorist/journalist Laurent Ruquier who hosts his own radio show. Ruquier attacked de Villejoie, his committee and their Miss France who was not invited to Ruquier's show to defend herself. De Villejoie contacted Ruquier and the director of Ruquier's radio station - Europe 1 - demanding that he be given a chance to rebut Ruquier's unfounded claims. 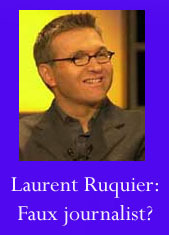 Ruquier, who has a reputation for being vulgar and arrogant, never replied. De Villejoie persisted in his attempt to communicate with Ruquier who managed to leave a vague message in the CMF's answering machine. After several attempts, de Villejoie finally received a phone call from Ruquier. Instead of apologizing, Ruquier insulted de Villejoie and denied having slandered de Villejoie's CMF and Miss France, even though Ruquier's comments were caught on tape. Unable to withstand de Villejoie's protest, the "spineless" Ruquier hung up. Thirty years ago, a similar incident occurred when radio host Jacques Chancel accused de Villejoie's newly elected Miss France as a fake. Despite CMF's loud protests, Chancel never retracted his offensive comments. 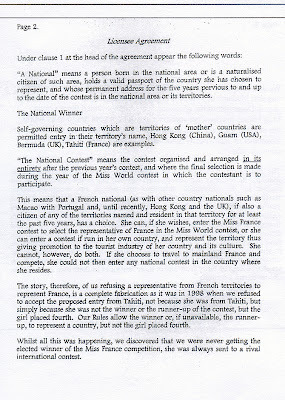 Mulmann's annual Miss France pageant is broadcasted by channel TF1 that has been accused by its enemies to engage in unlawful and unethical practices, mostly at the expense of televiewers. 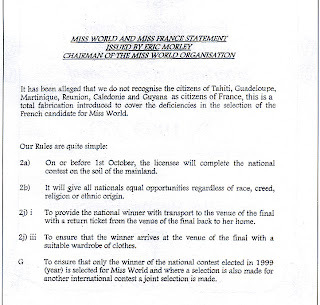 In fact, a group called Association Nationale pour la Transparence dans les Elections de Miss France (ANTEN) has been trying for several years now to show that the Miss France elections on TF1 are fixed and that televiewers who pay to vote are victims of swindle. De Villejoie, who states that he is not associated with ANTEN, is convinced that TF1 has fallen under the spell of the Hat Lady. 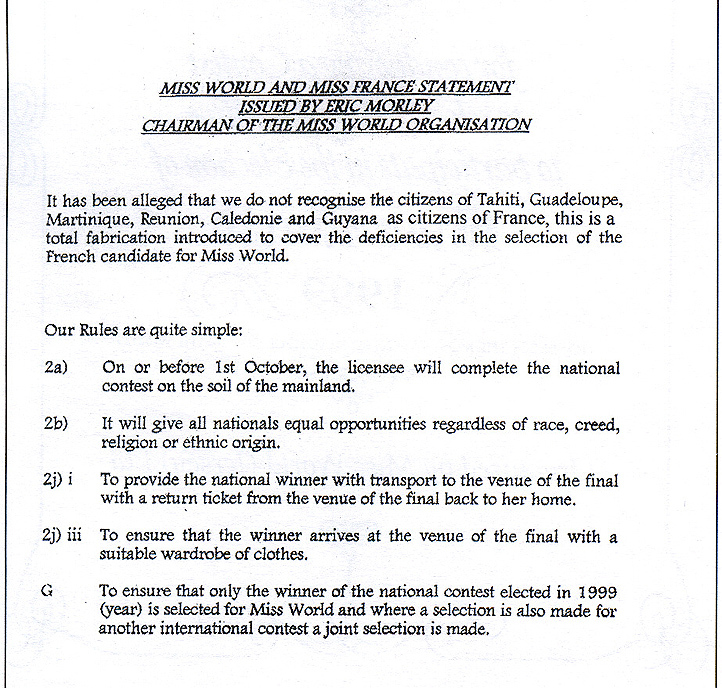 During the election of Miss France for Miss World 2000, ANTEN had allegedly dispatched an "observer" to Versailles' Trianon Palace where the pageant was taking place. 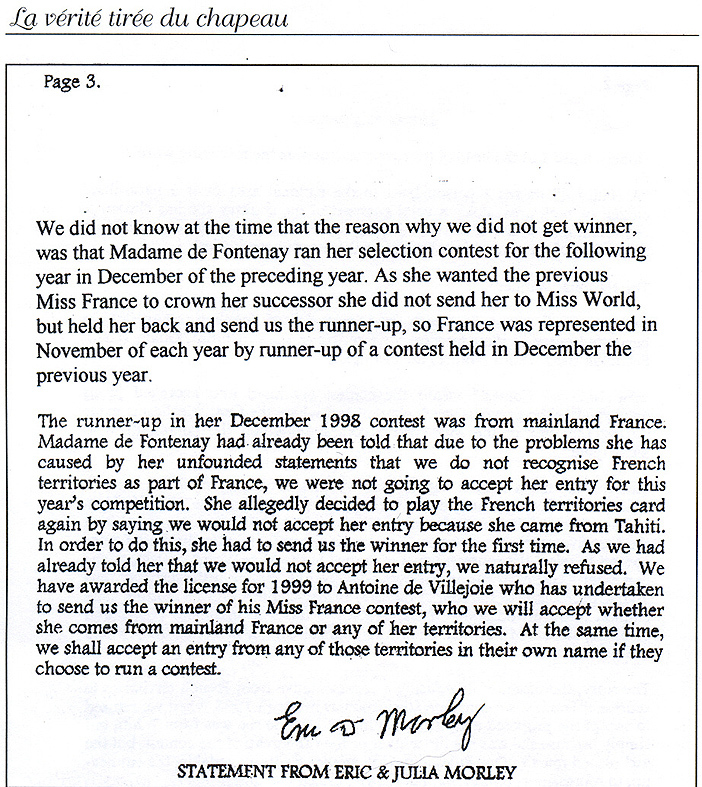 It was later discovered, during a court hearing, that it was TF1 who had sent the observer to videotape the pageant without CMF's permission. The pirated tape showed footages taken backstage and in the dressing rooms. 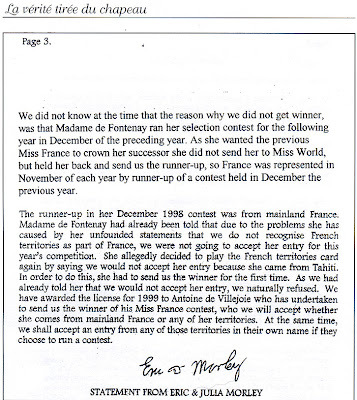 The young woman who won the pageant, Karine Meier - disgusted by the images in the video - filed a complaint in a Parisian court on May 2001 against TF1, GLEM Production, and Xavier Poirot for unauthorized filming of the pageant. 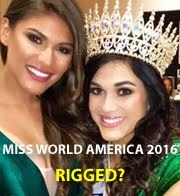 Now that de Villejoie's Comité Miss France won the franchises for Miss Universe and Miss World pageants, has justice finally favored him? In some sort of way, yes. His claims, accompanied by tons of legitimate documentation that he has amassed during the years, appear to be more convincing and sound than those presented by Geneviève de Fontenay, and even more so than those claimed by Jean-Louis Giordano. De Villejoie is now is his august years and has no intention whatsoever of giving up the precious title of président that he had inherited from his benevolent friend, Guy Rinaldo. De Villejoie may have won the war, but his battles are not over. Somehow, there are other tricks that de Fontenay has still not pulled out of her hat. De Villejoie's books attest to the fact that ugliness and corruption are universal flaws in pageantdom - and controversies will prevail if shady individuals remain convicted in twisting the truth. 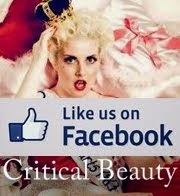 Hats off to de Villejoie for showing the world the true French concept of beauty and elegance.